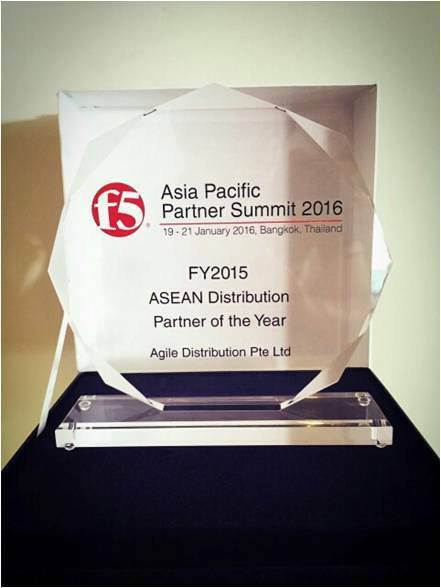 Singapore, 20th Jan 2016 – F5 held its Asia Pacific Partner Summit 2016 on Jan 20th in Bangkok, Thailand, where they announced their 2015 Partner Award winners during the award ceremony. 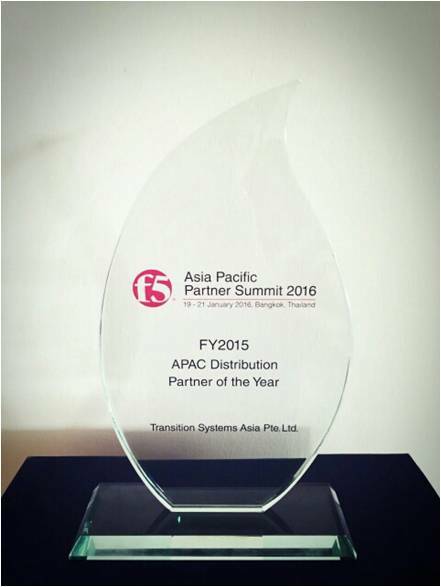 Transition Systems was recognized and received prestigious accolades “APAC Distribution Partner of the Year 2015” and “ASEAN Distribution Partner of the Year 2015”for its outstanding performance in Business Growth and Channel Coverage. Founded in 1999, Transition Systems Group is a leading value-added distributor of network, security and unified communications solutions in Asia Pacific region. Transition Systems partners with the world-class equipment manufacturers to provide resellers with an end-to-end solution portfolio to meet the needs of today’s business landscape. Transition Systems' expertise in both network and security solutions, coupled with its focus on excellent customer service, enablement and technical support, makes it uniquely positioned to deliver value-added services to solution providers (Resellers/System Integrators) and customers. Headquartered in Singapore, Transition Systems has offices across Asia. Transition Systems is an Exclusive Group Company. Exclusive Networks is the ‘go-to’ value-added distributor that accelerates market entry and growth for innovative cybersecurity, networking and infrastructure technologies. Combining specialist value-adding technical and marketing support inside each local territory, with the volume and reach of a global distributor, reseller partners rely upon Exclusive Networks to boost business opportunities and help achieve new revenues from the changing enterprise technology landscape. Exclusive Networks continually challenges traditional VAD models, redefining value and creating differentiation. We call this ‘Disruptive Distribution’. Exclusive Networks is an Exclusive Group division.